It’s a quick rematch from the pre-World Cup game that saw two Union veterans sent off in the first half. The Union will be looking to wipe away their poor performance in California and get back to the storyline that they’re a competitive team this season. Atlanta is good, everyone knows that. And they’re good on the road too, tied for first with LAFC for most away wins in the league. And they know how to handle the Union too, having beaten the Union two of the three times the teams have ever played. And of course Josef Martinez is on pace to have a record-breaking year, with six goals between him and currently-second-place for the Golden Boot Bradley Wright-Phillips. But that doesn’t mean they’re invincible. With Darlington Nagbe out, Atlanta have had to move reigning MLS Rookie of the Year Julian Gressel away from his strongest position on the wings and back to a more central location next to Jeff Larentowicz. This puts second-choice Hector Villalba into a starting position on the right wing. 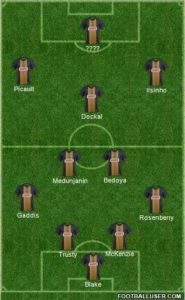 While this proved more than enough to beat Orlando City 4-0, it wasn’t enough to get past FC Dallas where this lineup lost 3-2. Other than those personnel shifts, this is essentially the same Atlanta United team that the Union saw earlier this season. So the strategy should be roughly the same: Keep them on their back foot, keep the ball away from Atlanta’s high powered attack and apply pressure to their significantly less impressive defense. Suspended: None, Chris McCann and Romario Williams miss next game if they earn a yellow card. The Union should be coming into this game with something to prove. As lackluster as the LAFC performance was, losing on the road to a very competitive team isn’t exactly a heartbreaker. This is going to be a home game, and we have every right to expect them to perform well, now that the full first choice lineup will be available. For 10 of the 11 positions, it’s safe to assume that the players will be the ones we’ve come to expect at this point. But only 10 of the 11. 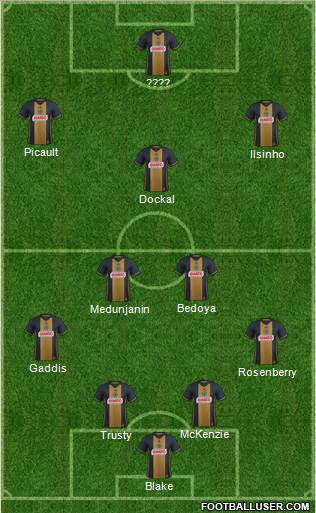 “Who will play up top” is the question on many minds while looking at the Philadelphia Union. Granted, we all know the answer already. It’s C.J. Sapong. We’re going to keep talking about strikers as if that isn’t the answer, but in our hearts we all know it’s just going to be Sapong. And head coach Jim Curtin should be held accountable if he chooses to do that and it continues to fail, as his refusal to bench a floundering starter will continue to hurt this team, as it’s has many times before. But if we step away from the reality we all know, we still don’t know who would replace Sapong. Cory Burke is the oft-touted answer, and he could be a perfect fit against Atlanta. He’s less defensively capable than Sapong, but if your game plan relies on constant attacks keeping the opposition’s offense away from the ball does that really matter? Furthermore, even if Burke doesn’t score goals, would it really affect the result of the game any more than Sapong not scoring goals? We can (and should) debate the reality of Martinez’ goalscoring threat, considering so many of his goals (and hat tricks) rely heavily on penalty kicks. The fact that so many of said penalty kicks rely as much on his theatrical talents as on his actual skill in front of goal is certainly something that will be recalled when we’re discussing his history in this league in the future. But if we’re being pragmatic, none of that matters. Whether he’s getting goals due to superior ability or his melodramatic ways, he’s getting those goals and the Union center backs will be tested by him. Finding a way to shut him down, without knocking him down, will be key if the Union have any hope of finding a result. This will be the Bosnian’s first game back after being suspended for losing his mind when the Uni0n went down to Georgia. If he’s able to come back and keep his cool, he’ll be essential in keeping the Union on the front foot. And that was the key to the Union’s (relative) success in the first twenty minutes of that game in Atlanta. 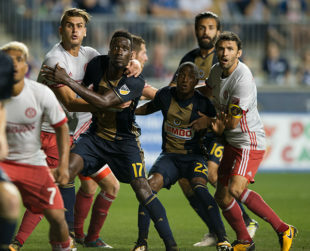 The Union played hard on the road against Atlanta, and looked to be the better team while they had an equal number of players on the field. If they’re able to match that performance again they’ll be aided by MLS’s road-team disadvantage, and there’s every reason to believe a result is possible. If Luis Suarez can make it through an entire World Cup without a red card, the Union should be able to beat Atlanta in Chester. And no biting anyone either!